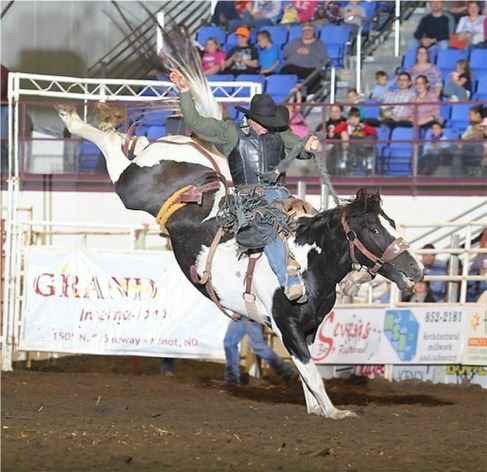 Minot Y's Mens Rodeo Coming Up This Weekend - Word on the street with Visit Minot!Word on the street with Visit Minot! The Minot Y’s Men’s Rodeo will be taking over the All Season Arena this week at the North Dakota State Fair Grounds. The 2012 PRCA Badland Circuit finals runs Thursday, Friday, Saturday at 6:30pm and Sunday at 11:30am. You don’t want to miss announcer “All American Cowboy Bob Tallman” and clown and barrel acts with J.J. Harrison including specialty act Rodeo Girl Trick Riders. Tickets can be purchased at the Minot Y’s Mens Booth in the Dakota Square Mall. Little Texas will be taking the stage Saturday after the rodeo. Doors will open at 8:30pm for the concert with the opening act starting at 9:00pm. Little Texas will be taking the stage at 10:30pm. Tickets can be purchased at Spicy Pie or at the Minot Y’s Mens Booth in the Dakota Square Mall.